What is it about the nuclear industry and polling? I never set out to pick on the nuclear industry. For one, they’ve got ready access to capital and probably know where to find a man who could administer a hearty dose of polonium. But as I’m in the habit of writing about public attitudes to the environment and such, I’ve found it hard not to notice that the British nuclear industry seems to have a particular enthusiasm for polling. To take a six-month period last year: in May, EDF had YouGov do a poll about different energy sources. A few months later, EDF commissioned more polling, this time among the population living near the Hinkley Point Power Station in Somerset . Then, just two months after EDF’s latest poll, the British Nuclear Industry Association joined in the fun, with the latest wave of their own annual poll, covering, yep, attitudes towards nuclear power. As with the earlier polls, the results are reasonably good for advocates of nuclear power. 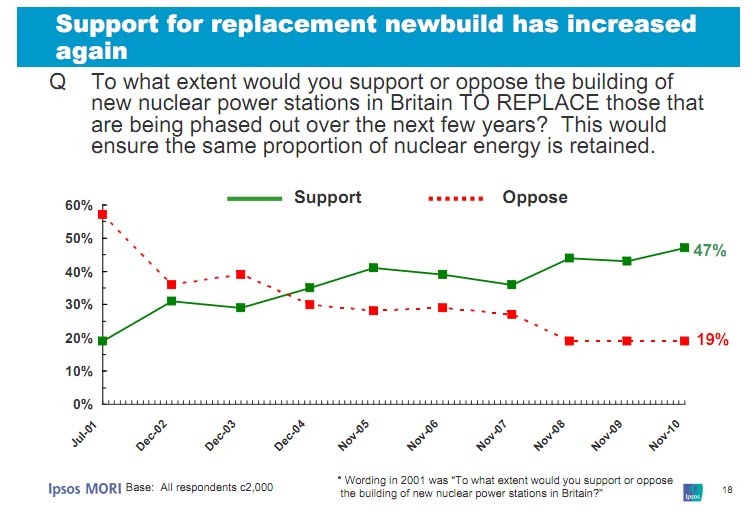 People in general are not overwhelmingly hostile to the prospect of building new power stations, either as replacements for existing ones (47% support, 19% oppose), or as additions to the current capacity (40% support, 23% oppose). When nuclear is included as part of the energy mix (along with renewable) as many as 69% will go along with it. But what I find most curious is the industry’s attachment to public polling. Clearly, it’s a PR strategy: each poll gets its press release, and is picked up widely in the industry and sometimes also in generalist media. We saw a couple of months ago that EDF successfully got local BBC coverage with their poll that apparently showed support for the new plant at Hinkley Point. That particular case worked quite well for the campaign about Hinkley Point, but I’m not sure what the industry is trying to achieve with such frequent public polling, when all it shows is gradual movement away from a position of fairly strong opposition. In the best situation, it allows them to demonstrate that they’re not reviled. But on the other hand, as the first chart above shows, support dropped between 2005-07. If you proclaim small increases in annual polls, you’re exposed when support falls away again. And above all, it seems strange for the nuclear industry to enter a beauty pageant with renewable energy, when it’s only going to lose. If the industry wants to make the case for more power stations, there must be better ways for it to demonstrate its strengths than to position itself as the people’s favourite. This entry was posted on Tuesday, January 11th, 2011 at 22:04	and is filed under Climate Sock, Energy sources. You can follow any responses to this entry through the RSS 2.0 feed. Both comments and pings are currently closed. Well, it’s not like they can point to their stellar record, is it? Nor can they point to the notable successes of recent reactor construction projects elsewhere in Europe. Polling is about all they’ve got.